Before doing a little research for this post, my thoughts on nail polish could be summed up by this generalization: There are two kinds of women in this world, those who wear nail polish, and those who don’t. Personally, I can’t stand the look or feel of polish on my nails. For the moment, Cora thinks having pink sparkles on her fingertips is the bee’s knees. When I see her proudly showing off her latest paint job, I’m not sure she’s my child. Her love affair is partly inspired (and sponsored) by her big sister, who has an ever-expanding collection of tiny colored bottles lining her dresser. As I asked Rosa about her nail polish collection, I got to wondering about nail polish as a rite of passage for young women. As it happens, there are lots of angles to explore regarding nail polish and visual culture. A PBS podcast introduced me to the term nail art. Turns out there’s a whole community of people testing the boundaries of nail polishing. I’m sure it just goes to prove how out of touch I am when it comes to beauty and fashion trends, but while I knew that nail enthusiasts gathered in salons for mani-pedis, I didn’t realize they gathered in cyberspace to share their ideas and creations. Google turns up nearly 20,000,000 links to blogs devoted to nail art, including 365 Days of Nails, a clearinghouse of designs sponsored by Nails Magazine (who knew there was such a thing!? ), and The Nailasurus which features tutorials and product reviews. Clearly this is an active community of practitioners devoted to their craft. As with the study of any art form, however, I’m not just interested in what people are doing, but why. As I searched for information on why women say they wear nail polish, I came across this story about a Saudi Arabian woman for whom nail polish became a political touchstone. I remember hearing about the rise of beauty parlors in the Middle East following the fall of the Taliban. But this story goes a step farther to show a real woman standing up for her right to wear nail polish. Of course I have to acknowledge my own bias in referring only to women thus far. Remember the news blip a few years back about the J. Crew executive featured in a promotional image painting her sons toenails pink? It stirred up a controversy, mostly among social conservatives, and raised questions that are important to discuss with young people about gender stereotypes. So, I’m left to ponder the tips of my fingers as sites for resistance. If Rosa can work out some of her teen angst there, I’ll be happy to provide all the nail polish remover and cotton balls she’ll need to refresh and move on. Even if I hate the smell. I haven’t been working much in the month of November. December is set to be more of the same, though I will have some final papers to grade from one course and am trying to revise the syllabus for another course that starts in January. I had hoped to get out of town during this time. I feel a really strong need to be far away. But I also feel compelled to stay at home, to get some things accomplished around the house that I’ve been putting off, and to reflect on the past few years in preparation for those to come. So, perhaps I should think differently about not getting away. Perhaps I ought to think of this time ethnographically, as a time for intense study of what’s going on in the wilds of my own backyard. 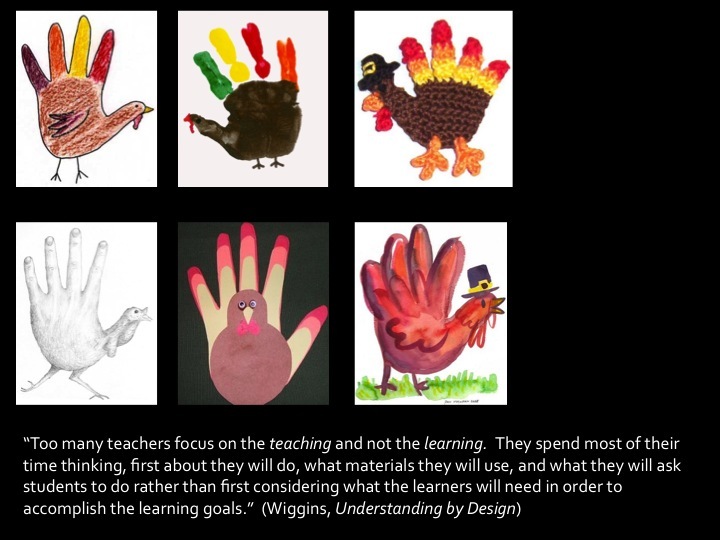 When It’s Your Kid’s Hand Turkey, Things Get Complicated. For years, I have used some variation of this slide in lectures on the selection of content for an art curriculum. It has been one way I’ve tried to make obvious the idea that authentic art education goes beyond arts and craft activities that anyone could pull from the Internet. Projects which result in students’ work all looking about the same as the result of following the same step-by-step procedure. 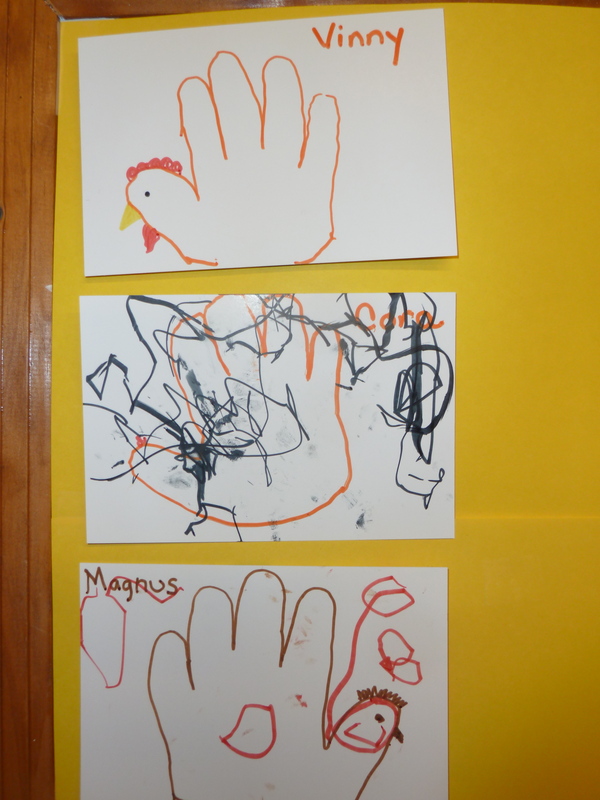 Though I was a reluctant curator of this menagerie of hand turkeys, I actually find it rather lovely. With just one example of each breed of bird, it actually demonstrates some level of creativity, variations on a theme. But a whole class worth of any one of these would have me running faster than you can say tryptophan. One morning, when I went to pick her up from the day care center at my gym, I found Cora at one of the small tables, drawing. She excitedly showed me a tracing of her hand that Miss Marty had helped her make, and then showed me how it was done. At first, I wasn’t sure what to say. There I was, starring straight into the face of one of my art education nemesis. But how could I deny the pleasure she was feeling at learning a new way to communicate her ideas? Why bother to mention the fact that Thanksgiving should really be about more than turkeys, or that I’m primarily vegetarian and she doesn’t eat meat either? Was I really prepared or interested to critique what she did while I was working out as long as she was safe and happy? The answers to these questions came to me over the next few days and solidified when I saw my daughter’s artwork hanging on public display for the first time. Knowing that the boys whose work appears above and below hers in the photo below are too young to have possibly drawn the faces on their birds, I love that Cora drew all over hers. I can see her thinking, and I can hear her narrating her actions, through those lines. I love that Miss Marty let her make her own marks and that she honored them by hanging them on the wall. And I love that she’s having opportunities to explore making her mark apart from me. So, when that turkey comes down from the wall, you can bet I’ll be taking him home and finding a very special place for him. 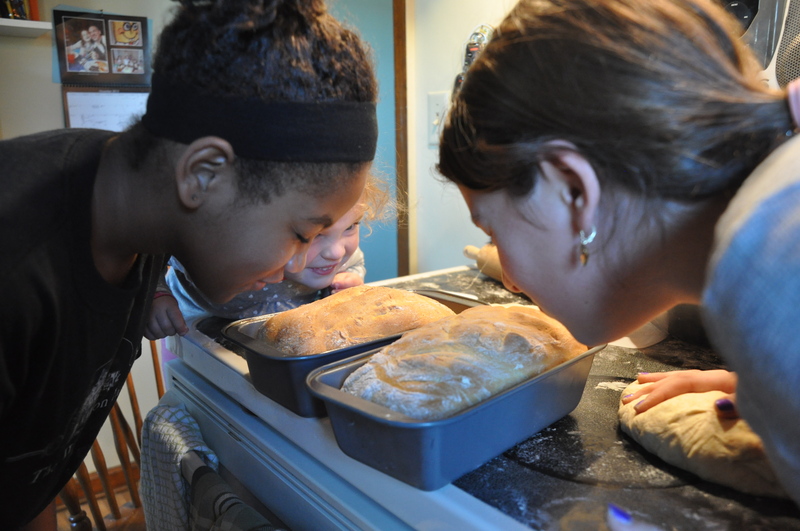 I admit, it wasn’t how I originally envisioned spending the sunny Sunday afternoon just before Thanksgiving, but baking bread with my stepdaughter and her friend this afternoon, was ultimately rewarding. 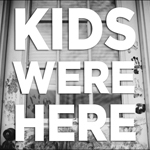 Somewhere in between keeping the kitchen from getting completely covered in flour and washing all the bowls and baking sheets, I found a few moments to reflect on what was happening with regard to parenting and pedagogy. Here are a few of my take-aways for the day. Children thrive on completing concrete tasks together. If you hadn’t guessed already, baking bread today wasn’t my idea. 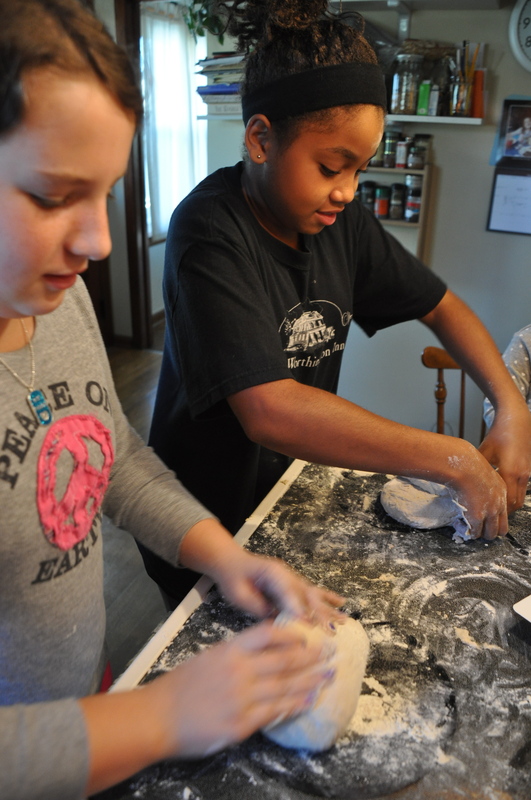 It was part of the King Arthur Flour Life Skills Backing Program, in which kids learn how to make bread and are given supplies to make a few loaves – some for a local food pantry or other community organization and some for their families. I remember when my stepson took part in the program a few years ago. Like George, Rosa and her friend were excited to try out the process they had seen demonstrated in school. While they never said so specifically, they seemed genuinely enthusiastic about experimenting with the alchemy of bread making, something they normally take for granted. And, they were very happy to be doing it together. I didn’t hear one complaint about how long it was taking or that they wished they had more time for other activities. Sometimes our children (students) need our help slowing down. Today, the girls frenetic eagerness to measure, pour, and mix forced me to slow down my own actions. I realized that I needed to be the calm I wished to see in my kitchen, and the world around me. At first, this impulse was a response to the mess the girls were making as they lost control of their bodies to the raging hormones that cause them to get overly excited about just about everything. But then, I realized it was bigger than that. I wanted the girls to feel the sense of control that comes from reading directions and doing things right the first time around. To see things they wouldn’t see if they were rushing, to make new connections, to build some appreciation for the magical process they were engaged in. As they mixed and waiting, kneaded and waited, shaped the dough and waited, put things in the oven and waited, I could feel them relax and loose themselves in the activity just a bit. It was even quiet for a few minutes. Highly unusual for this pair. A loaf of bread is much more than the sum of its parts. While I couldn’t find a list of teaching objectives for the Life Skills Program, I know that we were practicing and applying skills from a wide range of disciplines. I’d be interested to see a list of the learning standards addressed while baking bread. However, I imagine important things that were learned in the kitchen today that wouldn’t show up on such a chart. I’m sure things were learned today that I will never know. This Is Gonna Be A Lot Harder Than I Thought. OK. Enough with the whining. You’re busy too, I realize. I think the positive thing I need to focus on now that I am sitting down and putting letters to the screen, is that I am feeling good about it. It doesn’t feel like drudgery, I’m not checking the clock to see how much longer I have to work, I’m not jumping over to Facebook every few minutes to see if anyone “liked” my latest status update. I’m just here, thinking and writing. How can I find time for more of this? How can I make time for this reflective writing practice once I’m teaching again in January if I can’t do it now? But It’s probably time to explore some child care. But, while I want to let go a bit, while I long to have time for myself, I also realize that my time with Cora is fleeting. Before I blink my eyes she’s going to be as old as Rosa. And I already feel like I’m missing out on things because I give her as much space as is safe to venture around the house on her own explorations and occasionally plop her in front of the t.v. once in a while so I can get the dishes done. What’s she being exposed to in those moments? What connections is she making that I’m missing? Of course this could all be avoided if Cora hadn’t given up napping. But, in the end, I won’t be with her for every moment in her life. I guess I ought to start letting go now, before it gets much harder. But not too much, afterall, she’s only 2. Tonight, the house is full of young people. My husband says he likes it that way. Of course, I’m usually the one at home managing the crowd. Some days I am happy to let them do whatever they please, which usually involves various screens. Other days, I am more proactive about directing the action towards activities of an analog nature. I guess you might say I was feeling ambitious today. The day had been a gift from the weather gods – low 50s with sunshine in mid-November. In the later afternoon, I kicked all the kids out to enjoy the final hours of light. Lately they are more likely to spy on one another than play together, but by the time I got down the block to the playground with the wee one, the older kids and their friends were deep into some game involving a lot of running and a ball wildly hurling about. While the activity was punctuated by my kids loudly accusing one another of breaking the rules, for the most part, everyone was getting along, moving their bodies, and enjoying the time outdoors. 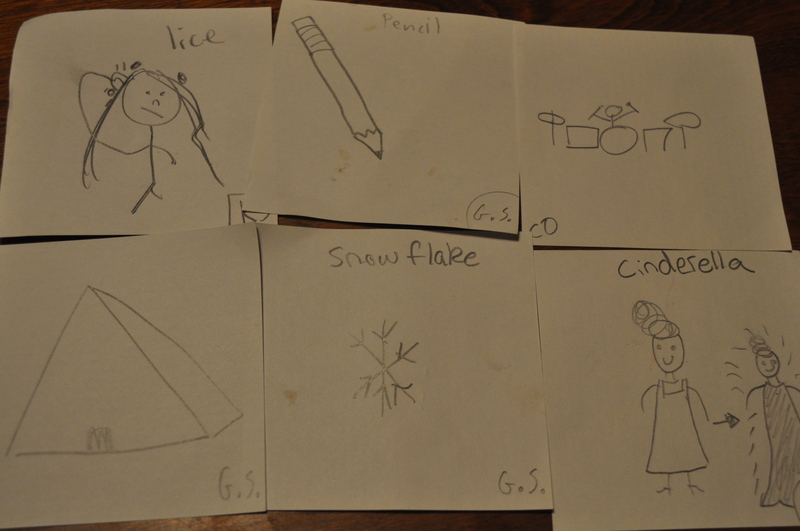 Then it was back to the house with cries of, “What’s for dinner?” Followed by, “When will dinner be ready?” We have a new drawing game in the house, so suggested the kids teach their friends how to play and give it a go while they were waiting. 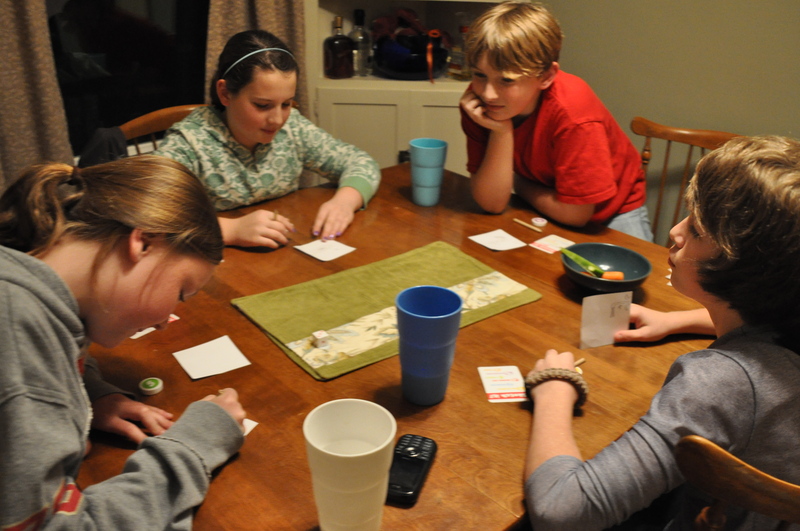 While I heard more sibling feuding during the setup, once the game was underway, everyone was having a good time and I was able to step back and find a moment to finish cooking and reflect on what was going on at our kitchen table. Sketch It! is a lot like Pictionary in that it challenges players to quickly draw objects and then other players then have to guess what was drawn. It’s different in that you form teams in each round, rather than maintaining a single team for the entire game. This perpetuates an alone-together gaming mentality–it’s every person for themself, but each person’s success is based on the actions of others. Seems like an apt metaphor for life. One thing I found really interesting about this activity from an art education standpoint was the simple fact that all the kids (11-13 years old) were drawing. This is a time, the literature tells us, when many children give up drawing for fear that they aren’t good enough at it to bother. As a result, I felt myself cringe a little when I heard them gang up on someone whose image wasn’t clear enough to convey the prompt. However, even in this moments of relatively harsh criticism, they seemed to be enjoying the challenge. Best of all, they were having a good time together, proving to me, and to themselves, that they can get along, when they want to. Is it my imagination, or is everyone glaring at me? One of the first things I remember our music teacher telling the class was, “It’s okay for your child to run around in here, as long as she’s not endangering herself or anyone else. That’s the way she learns.” I knew she was speaking to me in particular as well as to the group in general because, at that moment I was trying to figure out how I would corral Cora within the not-so-wide-open but big-enough-to-run-around-in room where we meet, and I’m sure it was written all over my body. Cora settled into the class for awhile but for the past few weeks, she’s been treating much of our time there like a track meet. She has a routine she’s been working through. During “The Hello Song” she runs back and forth across the room, through the center of the circle formed by all the singing mothers and children. She spends the next song running around the circumference of the circle. Then she does sprints from the middle of the circle to the one sunlit corner of the room. Last week, another boy joined her in the corner during one of her rest breaks. They stood with their backs against the wall, surveyed the group, and then started giggling and running around together. I sensed his mother felt he had fallen under Cora’s bad influence, until he started hugging and kissing her. That evened the field out a bit. We were united as the parents of the deviant kids. This past week was the same story. Only this time, Cora added a high-pitched screech to the mix. I tried to reach out and pull her into the circle a few times as she whizzed by me. She couldn’t decide if I was playing around with her or trying to get her to stop running, but either way, my efforts only made her scream louder. This hardly seemed better. I thought about taking her out of the room and talking to her, but she’s still a bit young for reasoning. So I went back in my mind, for the umpteenth time, to Leigh’s comments on the first day of class: That’s the way she learns. That’s the way she learns. That’s the way she learns. Cora knows the words to all the songs we are singing in class. She sings them day and night. The only time she doesn’t seem to sing them is in class. I’m not really sure what that’s about. 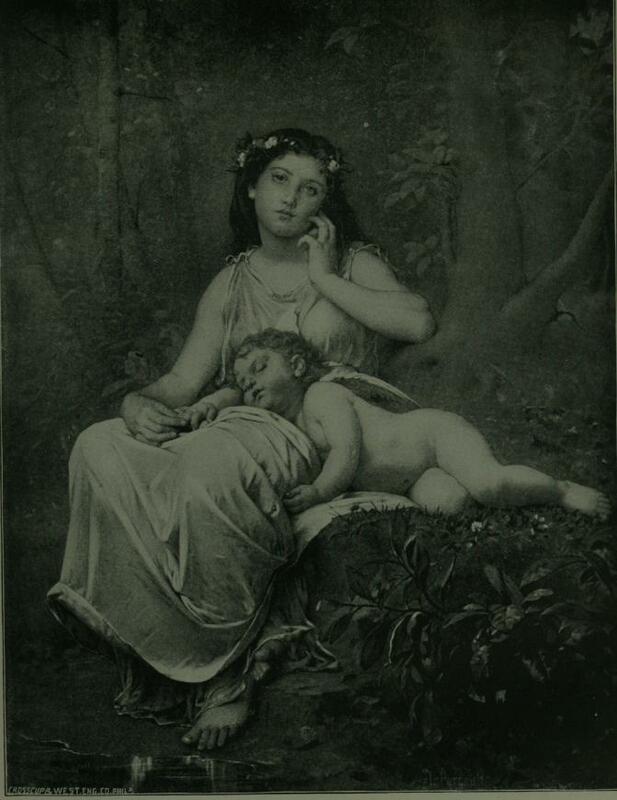 I wish she would sing and dance for the other mothers and their children. I wish they could hear how well she can mimic the flow of the music, holding the longer notes and clapping her hands to the beat. Instead, I feel like they are glaring at me and wondering why I bother to bring my kid to the classes just to run around.